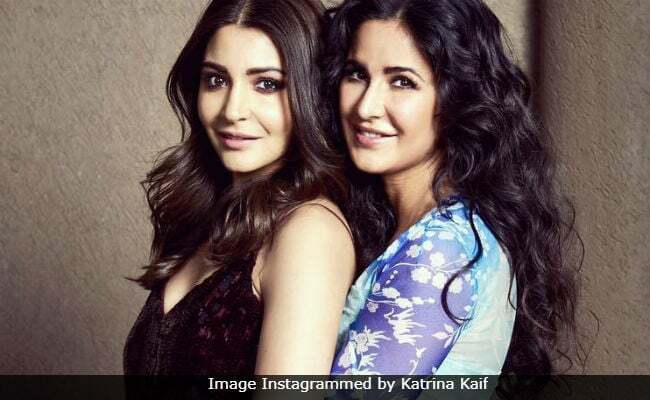 Katrina Kaif treated her Instafam to a stunning picture of herself along with her Zero co-star Anushka Sharma on Thursday and her fans simply loved it. The photograph happens to be from a promotional event for their upcoming film Zero. In the photograph, Katrina Kaif can be seen wearing a flowy blue dress, while Anushka can be seen dressed in a sleek black dress and both the actresses can be seen happily posing for the camera together. Just like us, Katrina and Anushka's fans were also delighted to see the picture and the 8 lakh likes on the post prove that. Soon after Katrina shared the picture on her profile, the post was flooded with several interesting comments such as "I can't tell you happy this pic makes me," and "seems like an effortless bond." That's not it, many Instagram users tagged both the actresses as "besties." "Please be best friends," wrote an Instagram user. "Wow! We have new besties in Bollywood," read another comment. 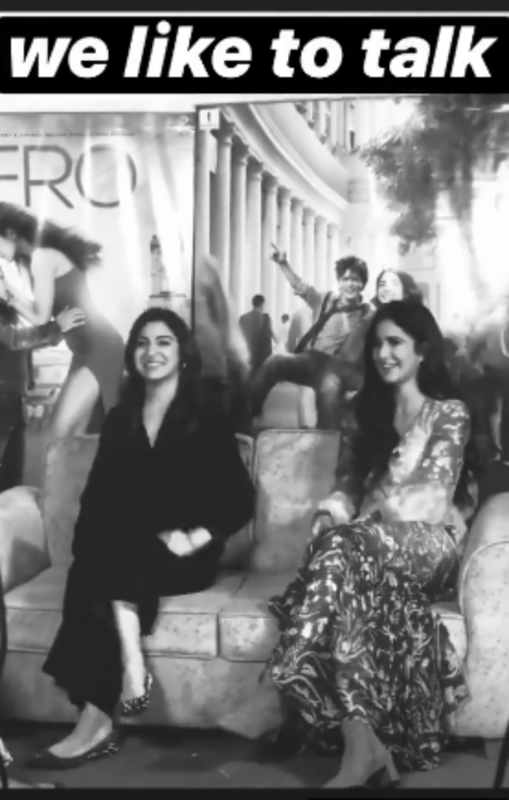 Meanwhile, Anushka Sharma also shared glimpses from her Zero promotion diaries, featuring Katrina and wrote: "Love this girl." Screenshot of Anushka Sharma's Instagram story. Katrina Kaif and Anushka Sharma have been friends since they filmed Yash Chopra's Jab Tak Hai Jaan together. Both the actresses share a great bond. 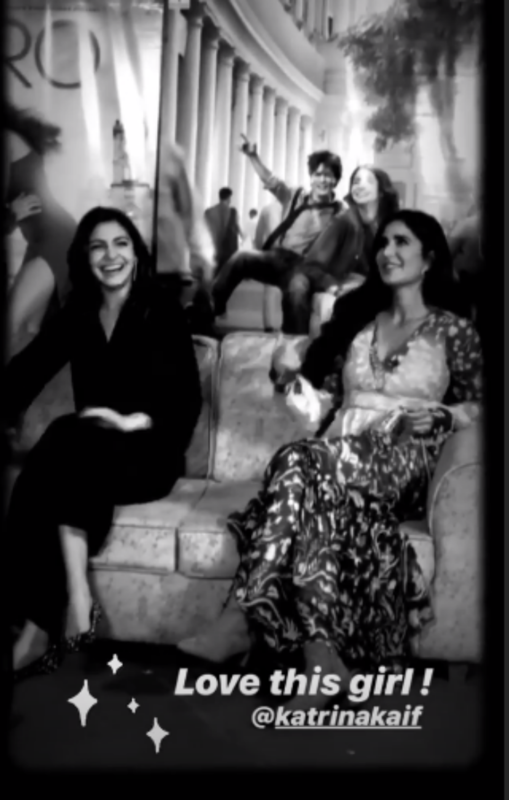 They even made an appearance together on the fifth season of Karan Johar's popular talks show Koffee With Karan and it was arguably one of the most entertaining episodes of that season. Zero is Katrina Kaif and Anushka Sharma's second film together. The duo have previously worked together in the 2012 film Jab Tak Hai Jaan, which also starred Shah Rukh Khan. Directed by Aanand L Rai, Zero showcases the love story of a dwarf named Bauua Singh (played by Shah Rukh Khan), who falls in love with a specially-abled scientist named Aafia Yusufzai Bhinder (Anushka). Katrina Kaif plays the role of a superstar named Babita Kumari in the film. Zero will hit the screens on December 28.